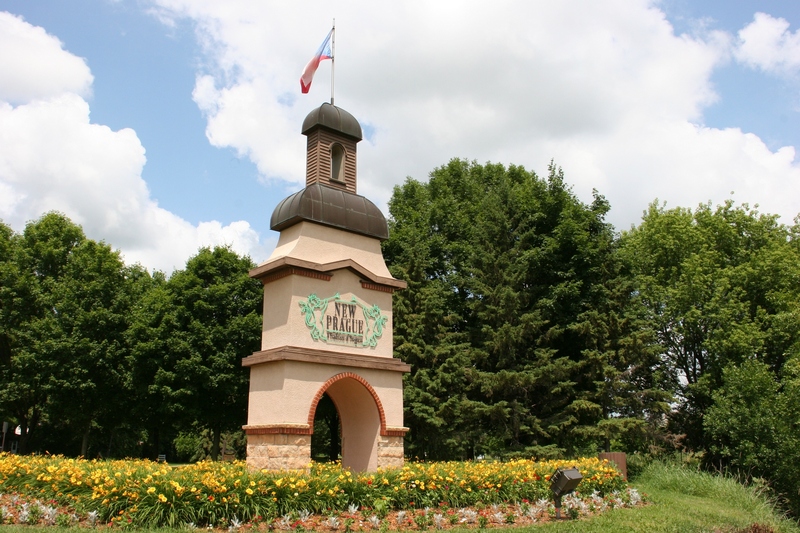 An impressive sign welcomes visitors to New Prague, Minnesota. DO YOU EVER HOLD expectations of a community that, in reality, are not what you envisioned? 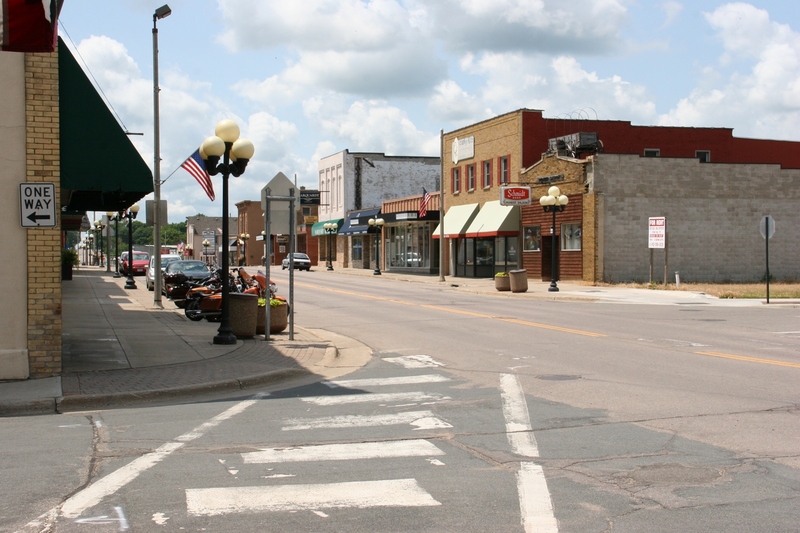 Minnesota Highway 19 runs through the heart of New Prague’s business district. 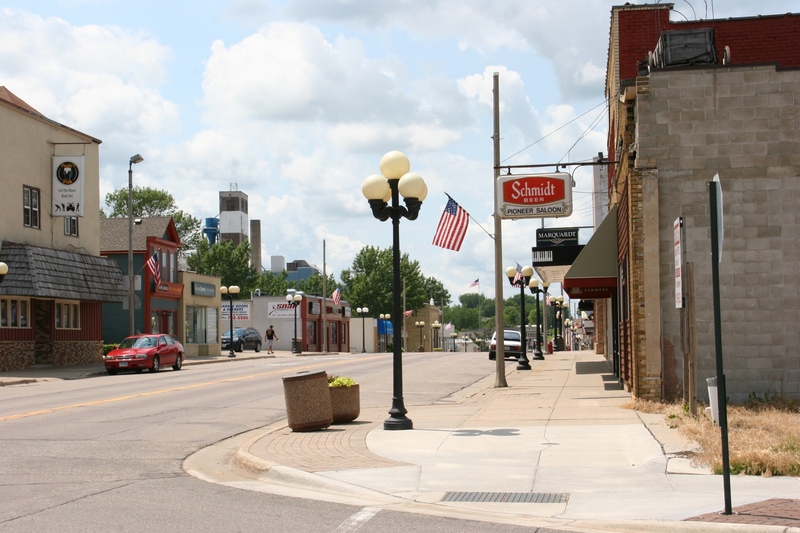 Such was my impression of New Prague, a southern Minnesota community of about 7,500 rooted in the Czech, Bavarian and Bohemian heritages. I expected a well-kept downtown burgeoning with lovely shops. 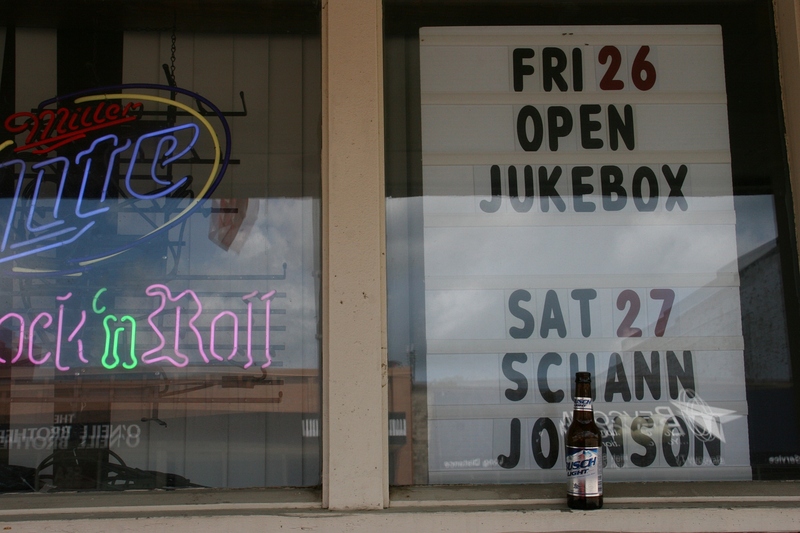 Beer bottles sat on windowsills and stoops at several downtown bars on a Sunday afternoon. Instead, on a Sunday afternoon, I found a Main Street that needs a facelift or, at a minimum, an attentiveness to appearance. Cigarette butts littered on sidewalks and beer bottles perched on window sills and doorsteps outside bars did not give me a positive first impression. 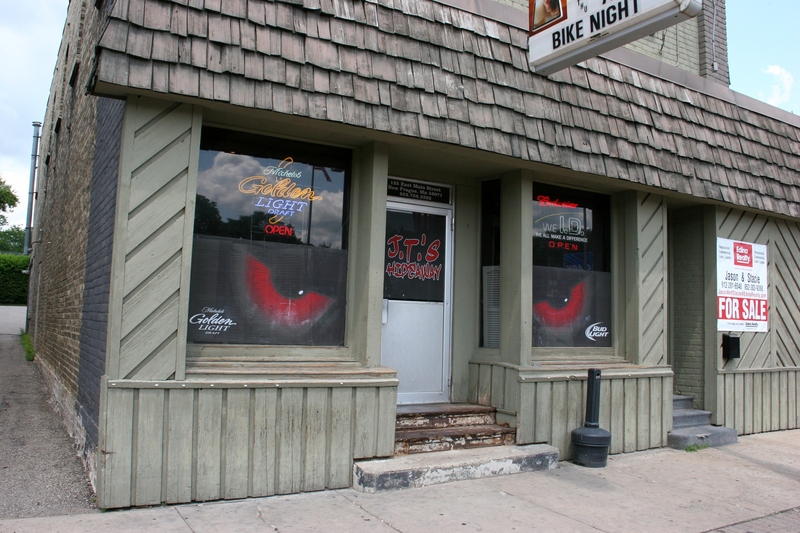 J. T.’s Hideaway, one of several downtown bars. Uneven and pitted sections of sidewalk made me wary of tripping. I noted worn steps and many weary looking buildings, with bricks even missing from the facades of some. I wasn’t purposely looking for these things. But they were noticeable enough that I noticed. The old hardware store, right, has great historic character inside and out. I also noticed many empty storefronts. Peering through the expansive front windows of the former Rynda Hardware, I spotted the loveliest of wood floors in a space that holds great potential for a business. 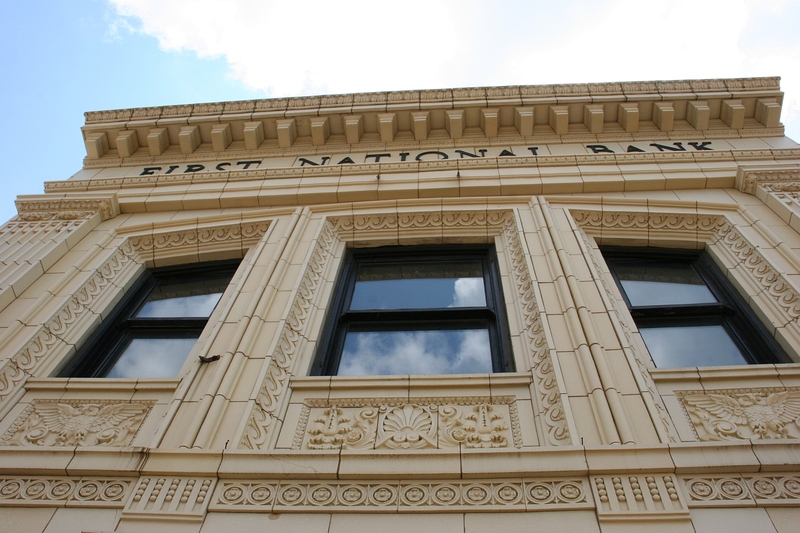 Looking up at the ornate architecture on the former First National Bank. To the right of the old First National Bank is the former Prague theater, now DalekoArts. 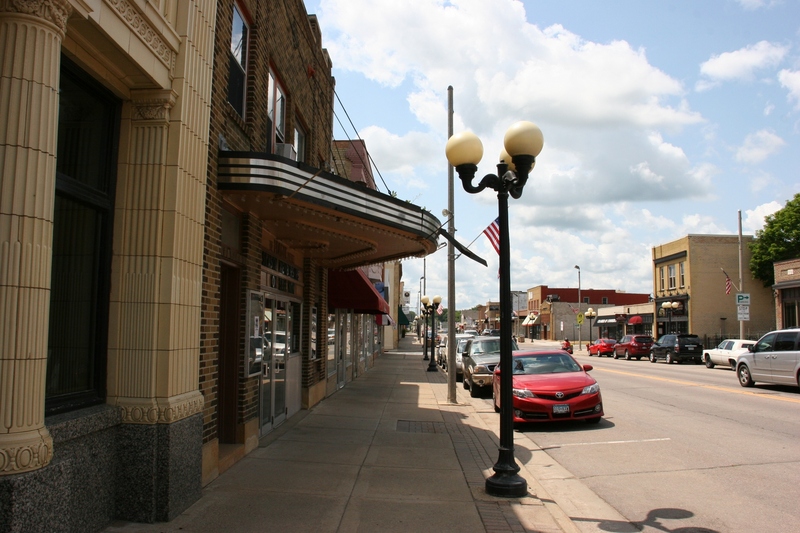 Another view of the bank and theater buildings along Main Street. That’s a key word here. Potential. 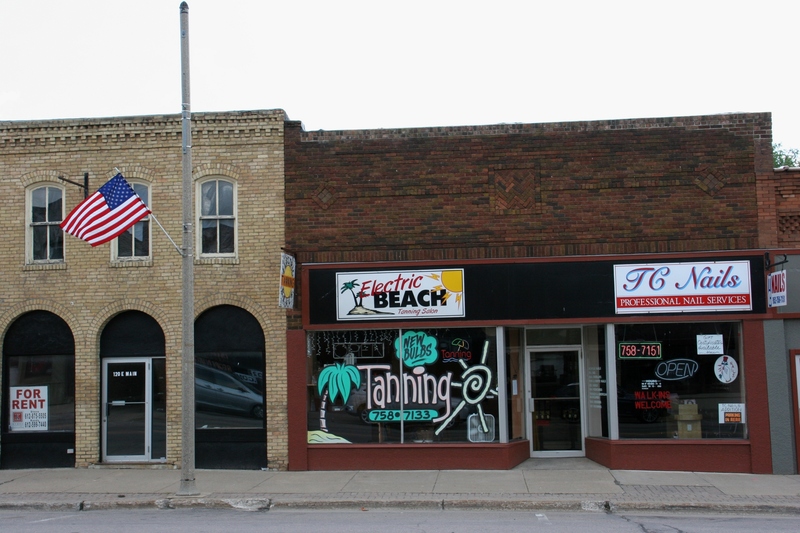 Downtown New Prague, with attention to visual presentation and detail, could really shine. 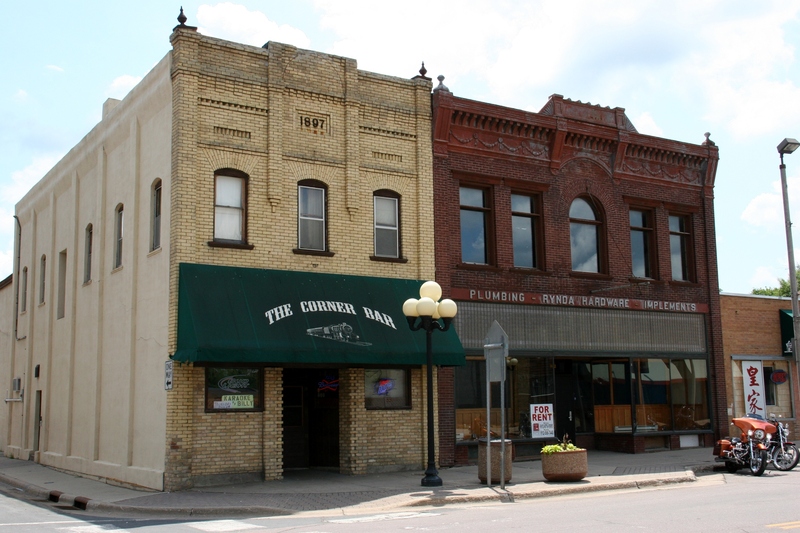 The many historic buildings are an asset to this community. 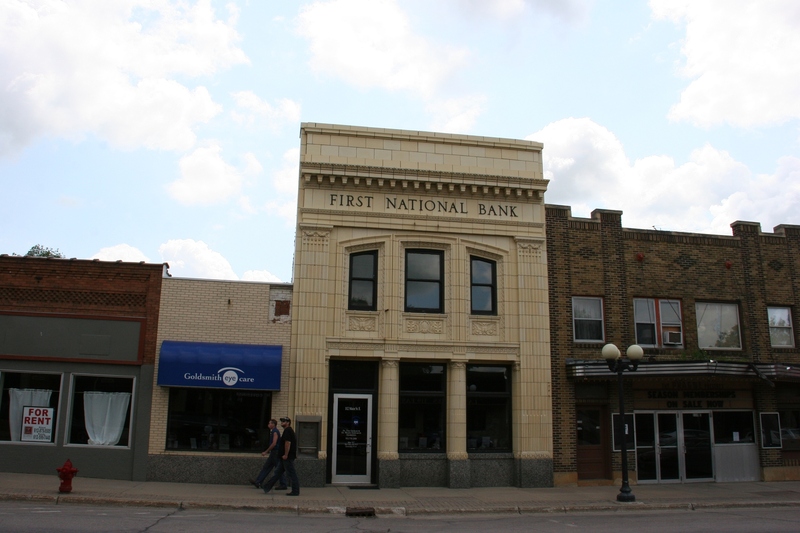 Some, like the former First National Bank, now home to an optometrist’s office, have been well cared for and stand as examples of what this downtown could be. Another building with space to rent. It takes money, and a strong desire, to improve the physical appearances of buildings to create a cohesive and inviting downtown. And I realize business owners are likely just getting by and don’t have extra funds. This tasteful awning adds a punch of color without overwhelming. But I see what can be done with a few simple details. 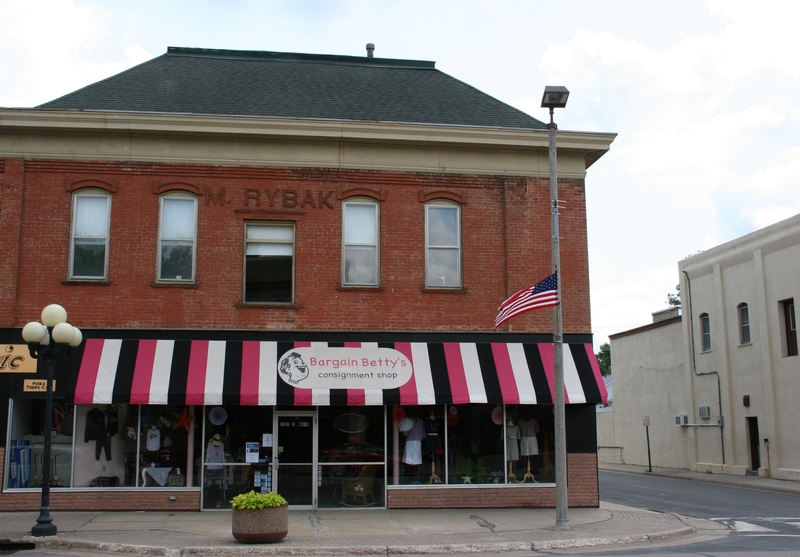 Bargain Betty’s Consignment Shop, for example, sports an eye-catching pink, white and black striped awning with pleasing graphic signage that makes me want to shop there, except shops aren’t open in New Prague on Sundays. That’s understandable given these mom-and-pop business owners need a day off, too. Love this sign suspended from a downtown wine tasting business. 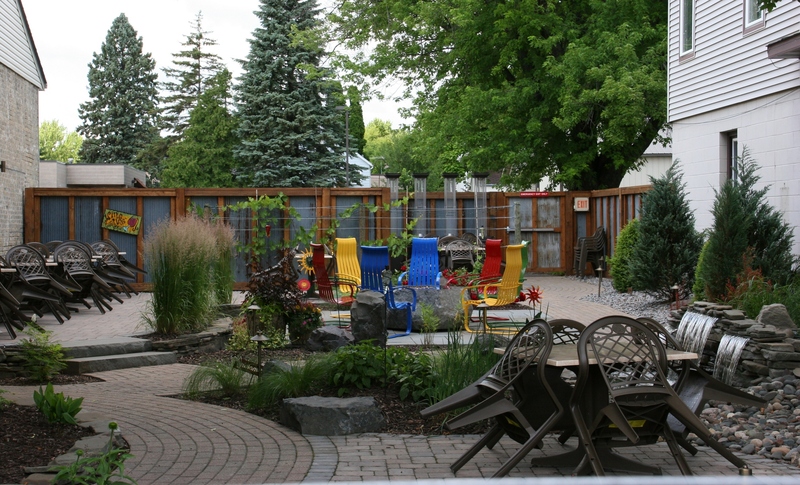 Prairie Pond’s inviting patio, closed on Sunday. The Prairie Pond building is an example of a beautifully restored structure. 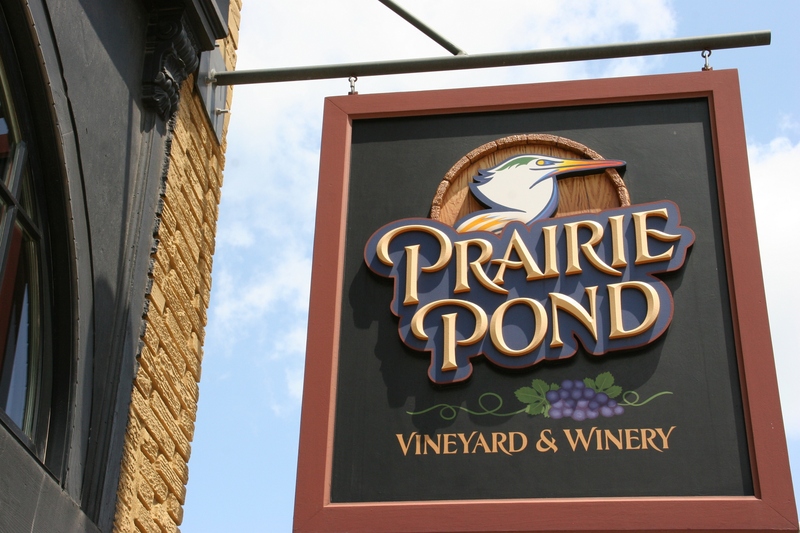 Prairie Pond Vineyard and Winery, in an exceptional restored building, has also created an outdoor patio oasis, complete with water features, between downtown buildings. My husband and I planned to sample wine there on Sunday, but found the place closed for a private party. It’s not typically open on Sundays, a disappointment. 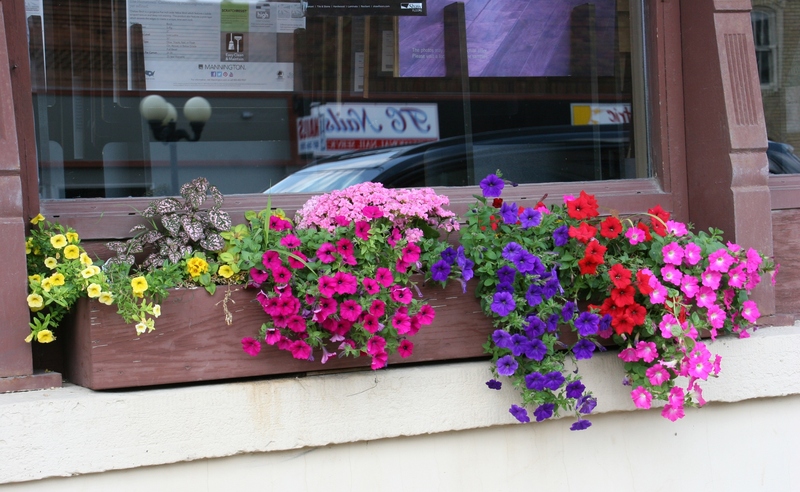 This stunning windowbox punches natural color and life into the downtown. 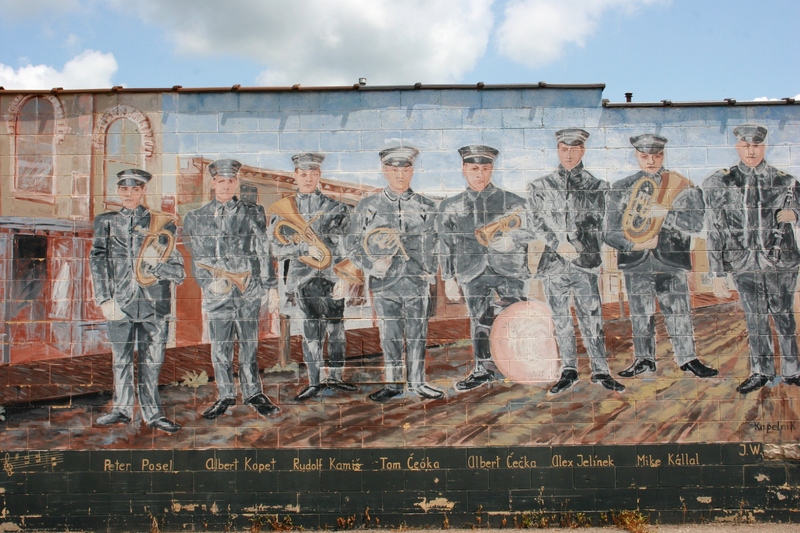 A mural of the 1906 Bohemian Brass Band adds artsy interest to the side of a building. However, the mural, painted in 1989, could use some freshening. 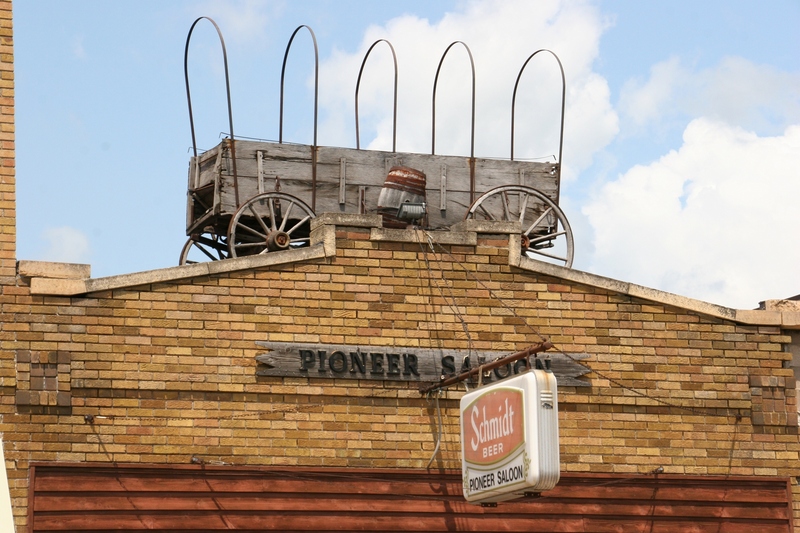 This weathered covered wagon atop the Prairie Saloon draws attention to the business and gives it character. Green spaces in the heart of a Main Street always please me. So do window boxes and planters brimming with flowers. And art. 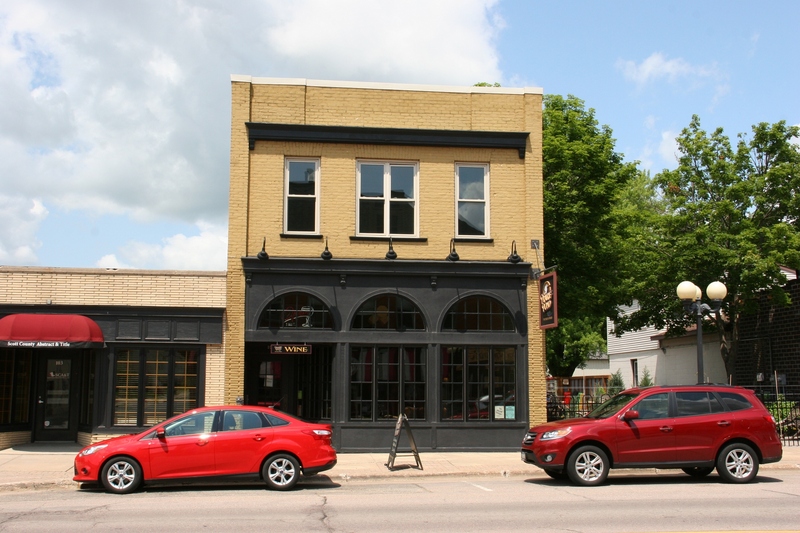 Downtown New Prague has some, but could use more. Again, it’s the seemingly simplest of details that can make a difference in how a downtown business district appears to visitors, whether they stop or continue driving through town. 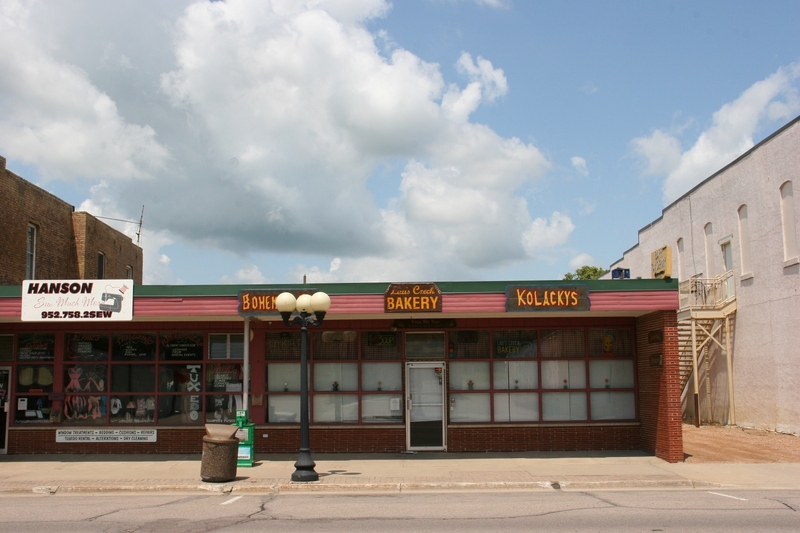 I definitely want to visit this ethnic bakery. 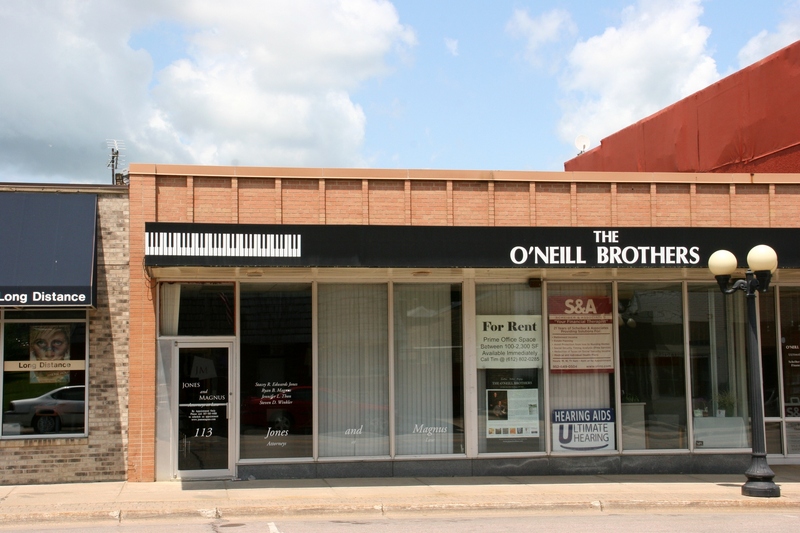 Businesses like this rooted in the town’s heritage are sure to draw customers. I don’t want New Prague folks and business owners to take my comments the wrong way, to be discouraged. Rather, I hope my observations are useful. I’ve often thought communities could benefit from an outsider’s first impressions. I’ll return to New Prague, but next time on a Saturday, when shops are open. I want to experience Main Street from the inside, too, not just the outside. Doing something with the vacant lot next to the Prairie Saloon (right in photo) would enhance the downtown. 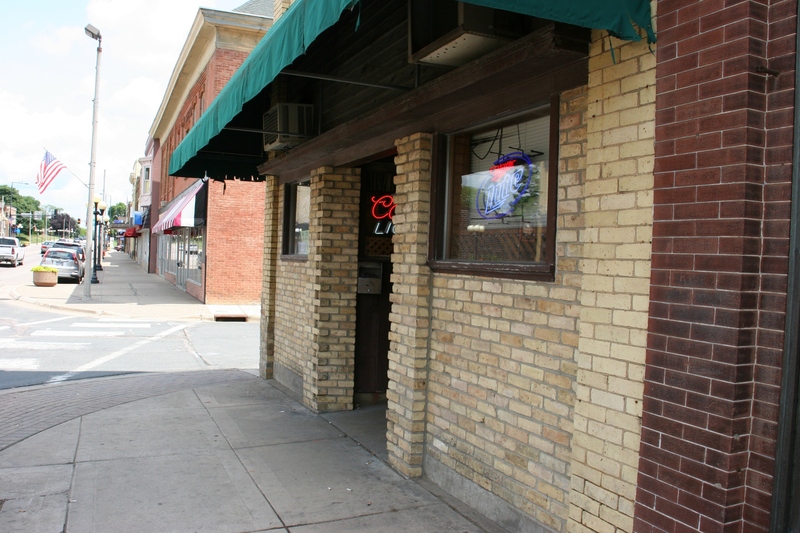 The Corner Bar is aptly named. Cigarette butts litter the sidewalk here as they did at other bars. 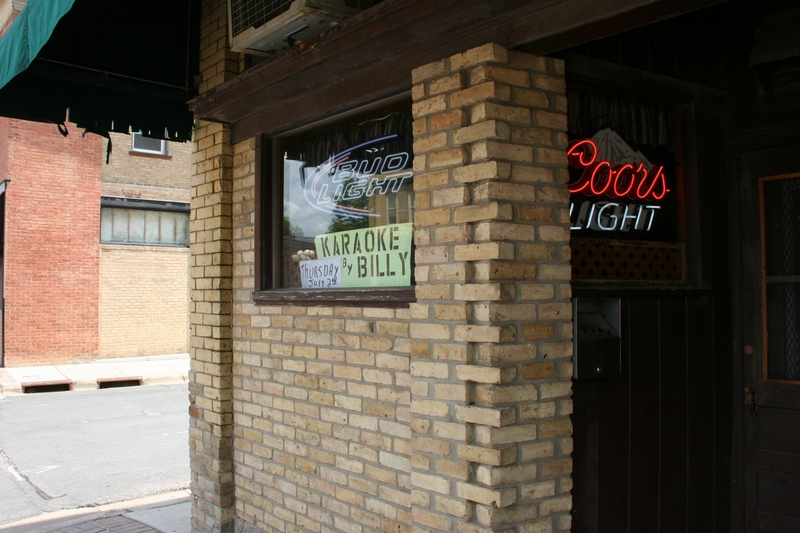 A close-up look reveals that the Corner Bar offers karaoke by Billy. This is what I love, local character. Another view of Main Street. 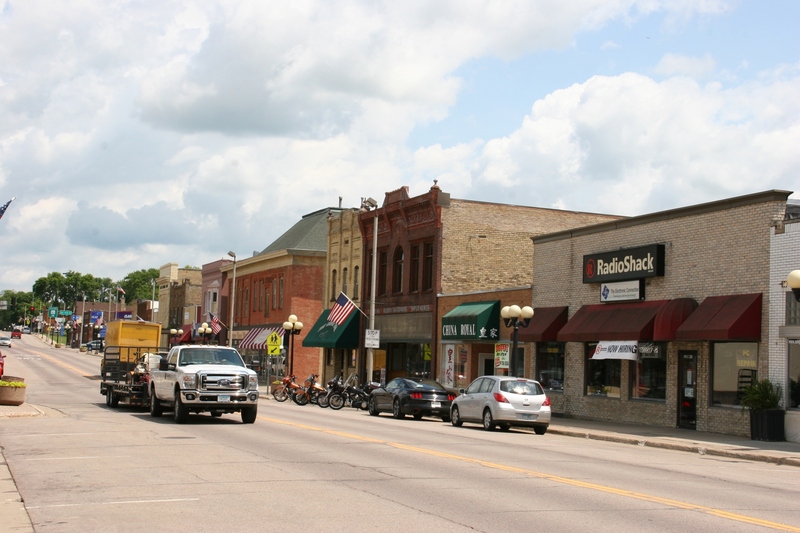 A variety of businesses line Main Street. If only all of the buildings could be restored to their former appearances, both in exterior and in subdued signage. 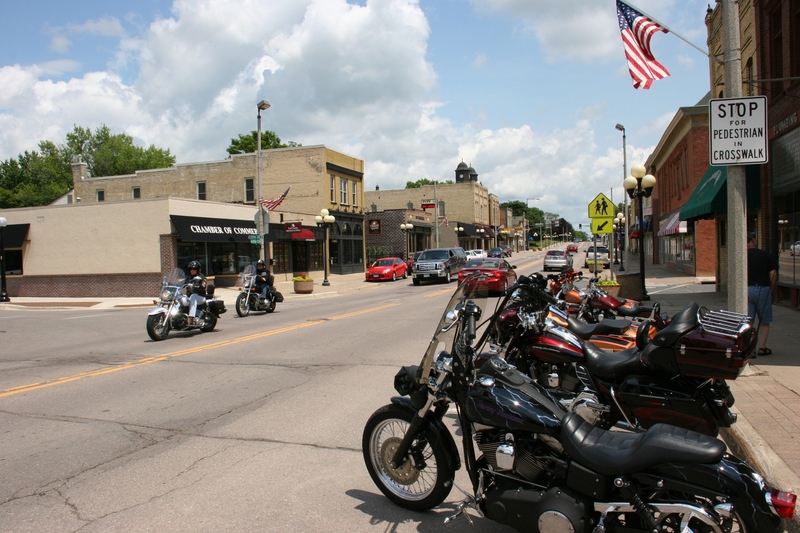 New Prague has a definite advantage over many other communities as a major state highway runs right through the downtown business district.